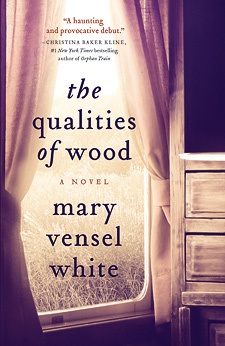 As part of her Book Blog Tour, Mary Vensel White appears today on Read Her Like an Open Book. In addition to my review, you can enjoy my interview with White and take advantage of the chance to win one of three copies of The Qualities of Wood (see below). When Nowell Gardiner’s grandmother dies, he and his 28-year-old wife Vivian decide to take a year off from their hectic life in the city and move to her now-empty house outside of a small Midwestern town. Nowell believes the isolation will be conducive to writing his second mystery novel, and Vivian, who wants to support Nowell’s artistic ambitions, will use the time to relax and clear out Mrs. Gardiner’s belongings. Maybe they’ll stay longer than it takes to clean up the house and sell it. Sounds downright idyllic, doesn’t it? But the setting proves equally effective at generating tension and isolation between the couple, who have been married only four years. Their nearest neighbor, the reserved 40-something bachelor, Mr. Stokes, lives a long walk away, across the Gardiners’ large rural property and through a small patch of woods. The locals are either overly friendly or taciturn and suspicious. The discovery of a dead teenage girl in the woods between the Gardiner and Stokes properties turns up the heat on Vivian’s percolating paranoia. Although the girl’s death is ruled an accident, Vivian remains unsettled by the incident’s proximity to her new home. Nowell responds in his usual matter-of-fact manner and shuts himself up in the office to tap away on his laptop all day, leaving Vivian to her simmering suspicions. Soon, Nowell’s ne’er-do-well younger brother, Lonnie, arrives with his sweet new girlfriend, Dot. The brothers can spend some time together before Lonnie begins a new job, and Dot offers to help Vivian clear out the attic and get the house ready for eventual sale. But Lonnie has a tendency to drink too much and he has a hot temper when provoked. And it soon becomes clear that there is unresolved conflict between the brothers. Is it simply sibling rivalry or is it something more complex and traumatic? Win a copy of The Qualities of Wood! Leave a comment below for one entry; share the link on Twitter for a second entry (include @Austraphile in your tweet). Three copies are available and the winners will be chosen on Friday, May 30. We see events mostly from Vivian’s perspective, but the question persists as to whether she is reliable. Was Chanelle Brodie’s death really an accident? If not, what happened out there in the woods that night? Is the killer among them? Is Mr. Stokes hostile and potentially dangerous or just an old-fashioned, laconic outdoorsman? Is Vivian’s new friend Katherine really as nice as she seems or is she covering something up with all that kindness? She is almost too good to be true for a lonely newcomer like Vivian — and she does seem to know everything about everybody in town. Why is Nowell so aloof and secretive, or is he simply preoccupied with the writing of his novel? Is Lonnie a loose cannon or just a rambunctious bear of a guy with a big heart and a taste for beer? Vensel White keeps everything just opaque enough to maintain energy and interest as the plot develops and the pages pass. The Qualities of Wood is a crisply-told suspense story combined with elements of a more literary character study. Vensel White effectively controls the shifting moods, from mildly ominous to oppressive, and the pacing, which varies from leisurely to pulse-pounding. Her debut novel skillfully examines the power and effect of secrets between lovers, in families, and in communities. Suffice to say, the web of connections between the many characters is more complex than even Vivian could imagine. The resolution of the plot’s many questions (and most of its conflicts) is plausible without being overly obvious, leaving the reader with the satisfying feeling that comes from a well-crafted and intriguing story featuring credible characters one truly cares about. Sounds like a great read. Interesting title! I’ve found books like this to be such a sweet spot for me. My first love is literary fiction, and my second love is mysteries. When I can find a writer that can write a good, suspenseful story that is also a character study, I’m such a happy reader. Another writer who I think does this really well is Tana French. Her books are marketed more as mysteries, but they’re so heavily character studies that anyone who wants a plot oriented book would get bored.